Animals and children are the subjects of photos, billboards, even entire advertising campaigns. Their antics make us laugh and sometimes bring tears to our eyes. At Maricopa Wells Middle School a unique program called P.A.W.S. (Pairing Animals with Students) links animals and kids in a mutually beneficial way — thanks to program founder and teacher Kimberly Frankel. To say that Frankel loves animals would be an understatement. Growing up in Arlington Heights, Illinois, she had dogs, cats, hamsters, mice, birds, rabbits and even frogs. At age 7 she began horseback riding lessons, competing in horse shows just a few years later. When her parents moved to Arizona, Frankel took classes in early childhood education as well as a two-year degree in Equine Science from Scottsdale Community College, interning in equissage in Virginia and becoming a certified equine sports massage therapist. Back in the Chicago area, she pursued her career providing therapy for show horses, race horses and pets. However, her income was not steady so she became a dog groomer. “I really loved working with animals, but after a few years I missed working with children and decided to go back to school for my degree in elementary education,” said Frankel. In 2006 Frankel moved to Maricopa, bought a home and began her student teaching at Pima Butte Elementary School. She completed her master’s degree while substitute teaching in the Maricopa Unified School District and was hired as a language arts teacher at Maricopa Wells Middle School in 2008. 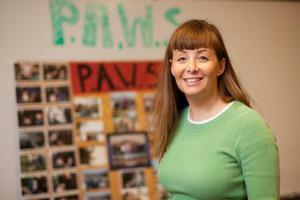 As a first year teacher she received permission to start a program to teach students about animals and decided to call it P.A.W.S. Frankel credits Mia, her adopted pit-bull/greyhound mix who is almost 16 years old, as the inspiration for the program. Frankel noticed that anytime she would tell a story about Mia, her students wanted to talk about their pets, often asking her questions about how to properly care for them. P.A.W.S. teaches students proper animal nutrition, grooming and basic healthcare, along with knowledge of specific breeds and training tips. Students also are introduced to future college options and career opportunities that involve working with animals. An afterschool program funded by a 21st Century grant, P.A.W.S. is now in the middle of its third year. Enrollment continues to increase with 30 students currently in the program. Considering that there is a substantial time commitment for both Frankel and the students, the level of involvement demonstrates the popularity and overall success of the program. P.A.W.S. classes are available at Maricopa Wells four days each week, Monday through Thursday. Daily instructional offerings alternate between domestic animals and large breed or farm animals with a specific day focused on equine science. Students also learn about marine life and ocean animals. Guest speakers, a pet sitter, a pet social worker, an animal trainer, a dog groomer, a K-9 officer and a therapy dog tester and certifier, have all shared their knowledge and training with P.A.W.S. students. Frankel also arranges occasional family days throughout the year to allow parents the opportunity to get involved in their children’s love of pets. Over the course of the program, the students have taken field trips for horseback riding lessons, to the Wildlife Zoo and Aquarium, several animal shelters, a dairy, local farms and the Scottsdale Arabian Horse Show. In February, Arabian Horse Times featured the students and the P.A.W.S. program in its magazine and sponsored their bus trip to the horse show. In addition to learning about animals and their care, the program offers students a chance to give back to pets and their community when P.A.W.S. holds fundraisers to help local animal rescue organizations. Currently the students are helping Please Rescue Me run by local resident Grace Reed. They bring in donations of animal-related items like toys, feeding bowls, collars, leashes and food and are now helping to find homes for shelter dogs. “I believe it is extremely important to teach my students about giving back to their community, and to show them how wonderful it feels to help an animal in need,” Frankel says. To volunteer with P.A.W.S. or get information about the program, contact Frankel at kfrankel@musd20.org or at 520-568-7100, ext. 3050.